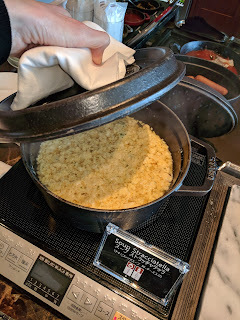 As I mentioned last week in my review of Oasis Garden at the Prince Gallery Hotel in Tokyo, I recently stayed at the Prince Gallery during my trip to Tokyo. It was a great property (ridiculously modern, incredible staff, etc, etc). 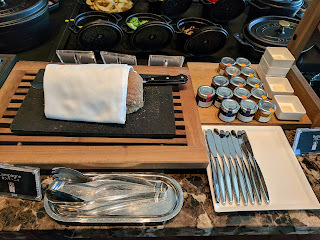 As a Platinum guest, I had access to the Executive Lounge, open all day, with breakfast, tea time, and evening canapes and drinks. 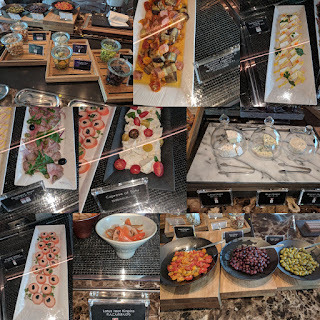 I mostly had breakfast down in the full restaurant (because, um, it had some really great options! 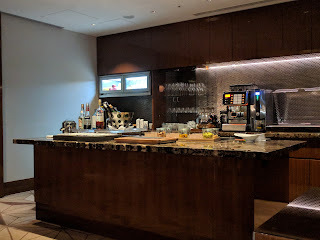 ), and I mostly wasn't around to enjoy tea time or evening snacks because I was either at work or out to dinner, but, I did pop through a few times to check it out. The offerings were generous, and really high quality. 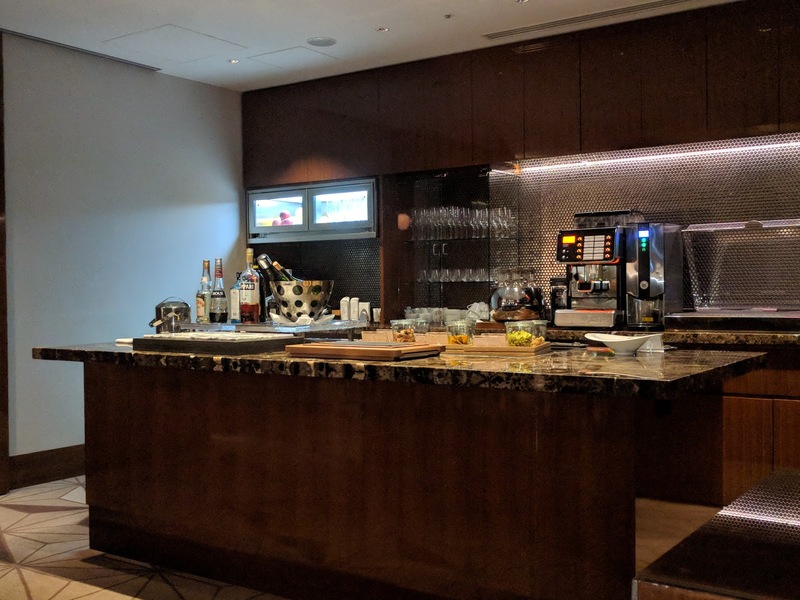 The lounge is located on the 34th floor (2 floors up from my room, 2 floors down from the lobby). Like the rest of the hotel, it has incredible views, and huge windows to take advantage of it. It is open from 7am - 10pm, with breakfast from 7am-10am, cocktail time from 5pm-10pm, and tea time in-between. The space was always pleasant. Comfortable seating, attentive staff who were not overbearing, and no rules like being forbidden from walking out with a drink. Seating came in the form of regular dining tables (with comfortable padded chairs) or lower cocktail tables with more relaxed chairs. The breakfast buffet in the lounge is actually fairly extensive for a lounge of its size, with continental selections, hot items, made-to-order eggs, pastries, and more. 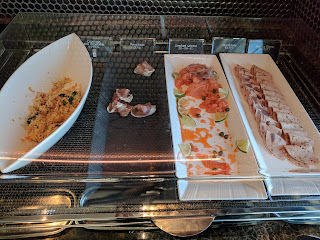 The selection at the buffet down in the Oasis Garden restaurant was better, and I had the choice to do either, so, I usually opted for that. 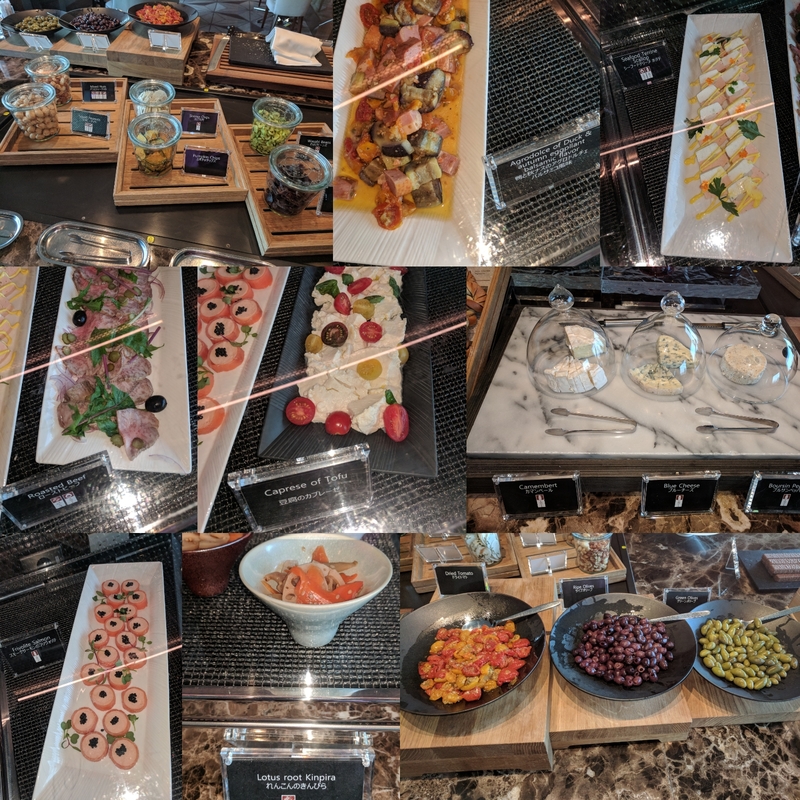 The continental offerings were mostly a subset of the more extensive buffet at the restaurant. Couscous and vegetables. Prosciutto. Smoked Salmon. Mortadella. Paprika Riona. This was basically the same as downstairs, with the addition of prosciutto. 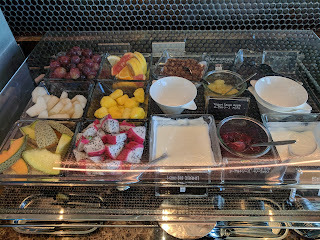 The fruit lineup was impressive for the buffet size, particularly the dragonfruit! 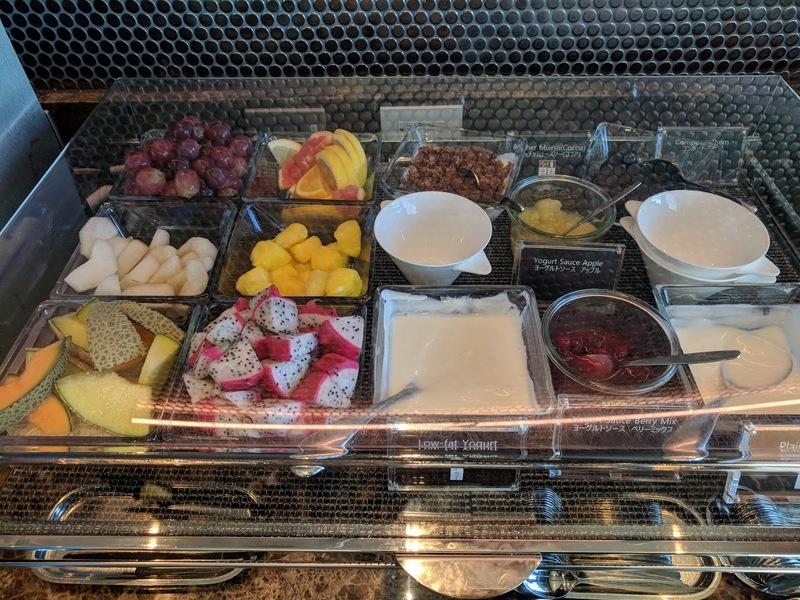 This section also had both low-fat and plain yogurt, and two "yogurt sauces" (apple and berry), just like downstairs. 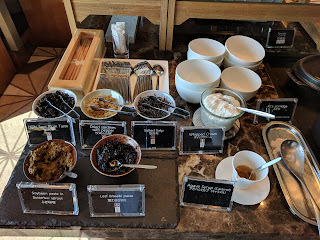 The one item that was featured here that I didn't see in the restaurant buffet was the bircher muesli (cocoa flavored). 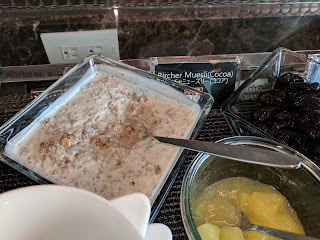 I tried it, but it wasn't really bircher muesli. It was basically just yogurt with the cocoa muesli mixed in. Soggy, tart, not very good. 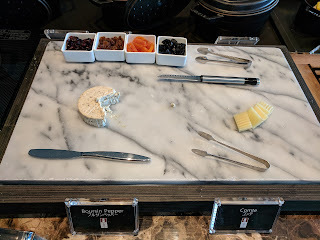 There was only two types of cheese in the lounge, boursin and comte, and 4 types of dried fruit (raisins, apricot, dates). 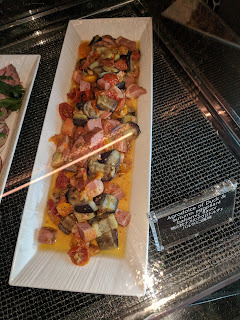 This platter looked a bit sad and empty on most visits. 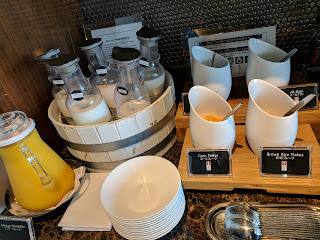 There was 4 types of cereal in the lounge instead of the 5 downstairs (corn flakes, brown rice flakes, all-bran, etc), and again, a slew of milks (5 different types - soy, rice, oat included). They really care about milk selection. Rather than a salad bar like in the restaurant, there were just two types of pre-made salads on offer, no additional toppings, and three dressings: non-oil yuzu soy sauce, french, and roasted sesame. 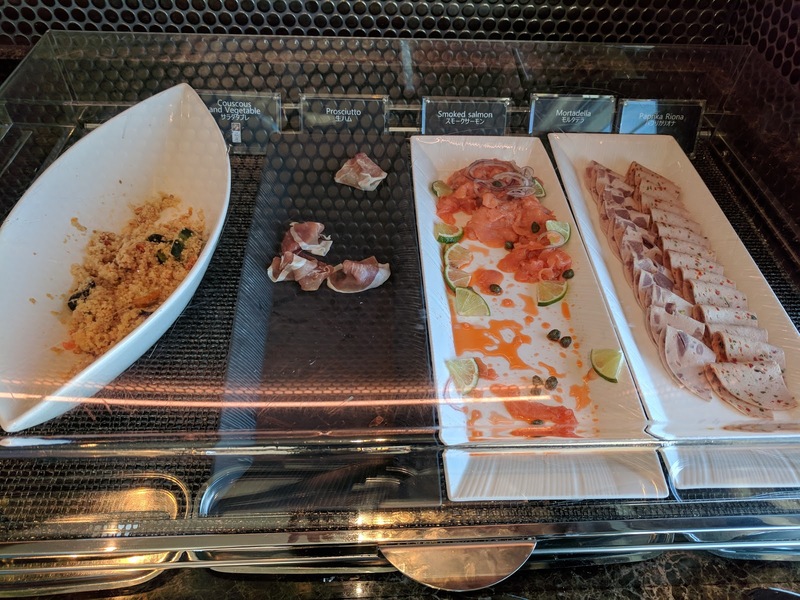 Again, the hot items were mostly a subset of the plentiful selections in the restaurant, and again, I was impressed by how many they fit in the small space. They did have different pancakes. And kudos for serving in thick cast iron pots, they really helped keep things hot, and of course, looked far classier than standard chafing dishes. 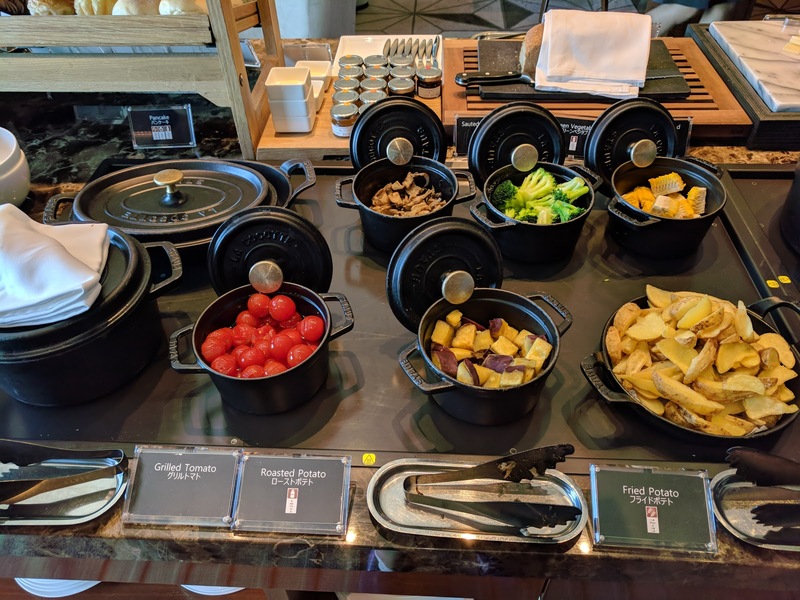 Grilled tomato, roasted Japanese potato, fried potato (front). Roasted mushrooms, broccoli, corn (back). 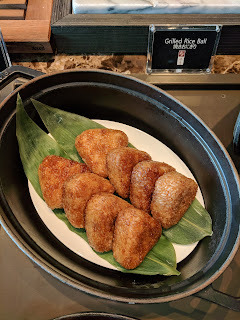 One morning this section also had grilled rice balls, which I never saw in the restaurant. They were decent, sticky rice with a bit of seasoning, although they didn't seem particularly grilled. The hot meat lineup was bacon, crispy bacon, pork sausage, chicken sausage, fish of the day. Yes, they even managed to fit in both types of bacon and both types of sausage into the hot meats section. 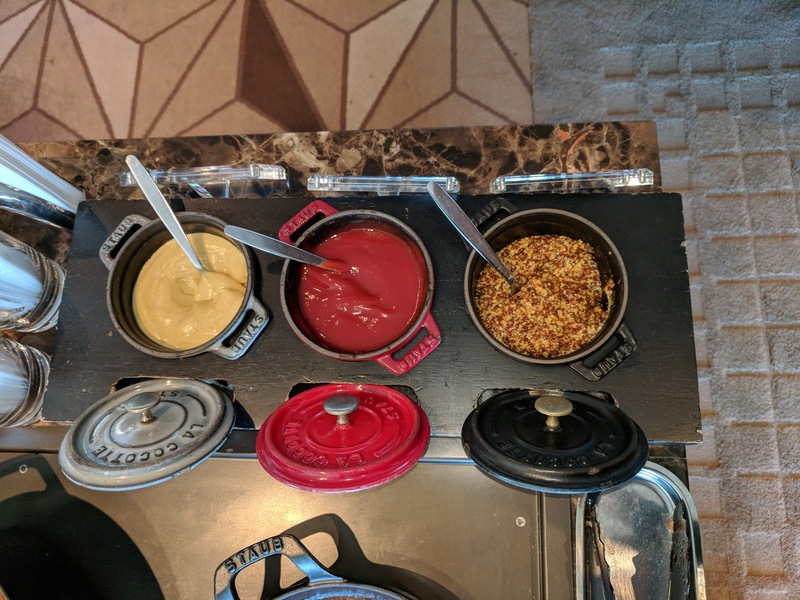 Same condiments to go with the meats. Again, such cute serving vessels. 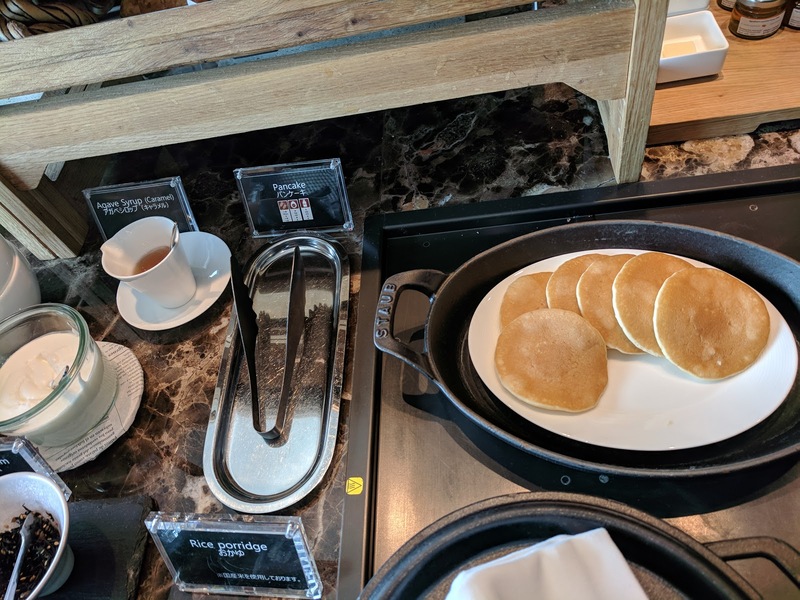 The lounge had regular thin pan cooked pancakes, unlike the thicker style down in the restaurant. To go with them, whipped cream and caramel agave, just like downstairs. Porridge toppings were a smaller selection than downstairs: hijiki sour plum taste, dried sardines with pepper, salted kelp, soybean paste in butterbur sprout, and leaf wasabi paste. I again loved all these salty flavorful things. Each day both locations offer a soup of the day. This looked to be egg soup? Another day had minestrone. 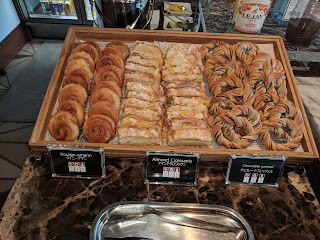 The baked goods lineup was a smaller selection of the same items as downstairs. 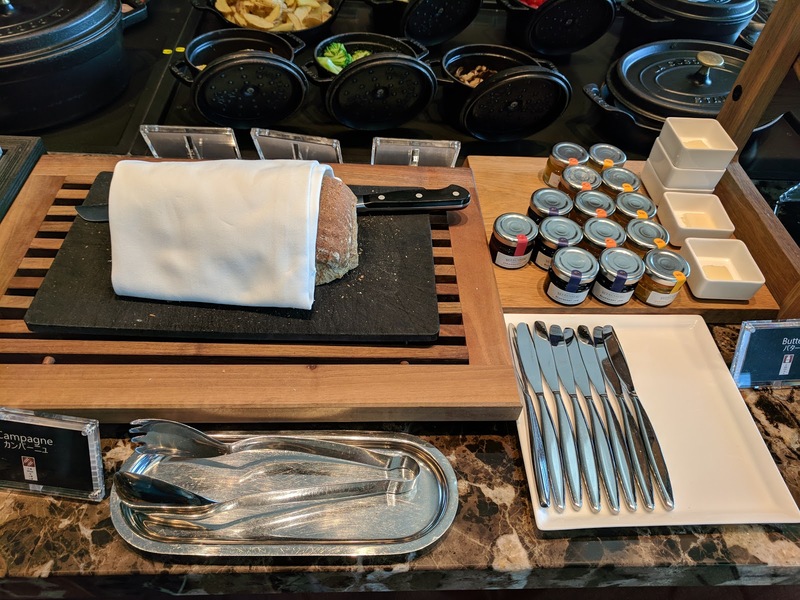 Bread to slice, assorted jams, pats of butter. 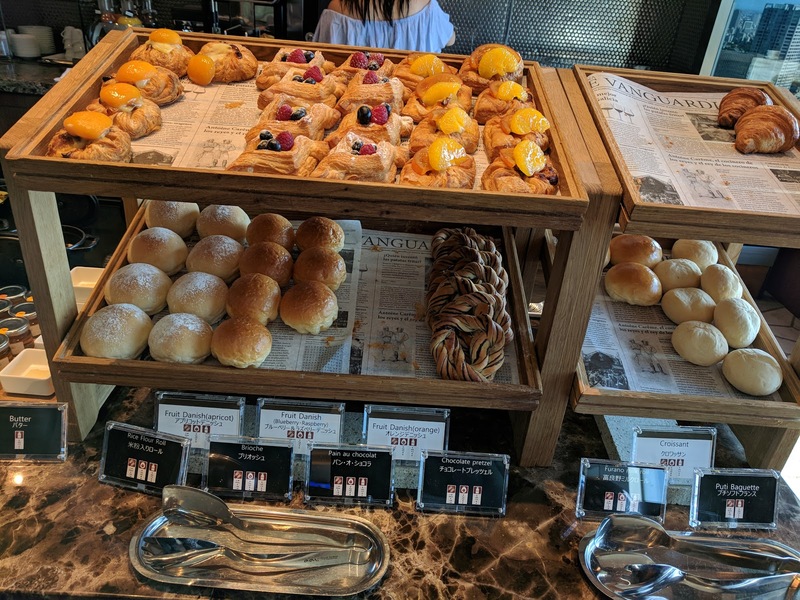 A slew of pastries: Apricot Danish, Fruit Danish, Orange Danish, croissant (top). Rice Four Roll, Brioche, Chocolate Pretzel, Puti Baguette (bottom). 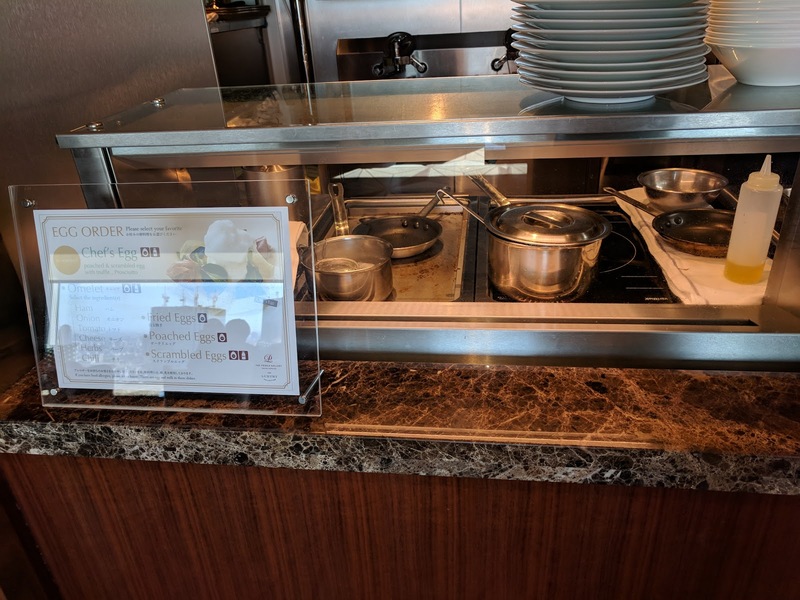 The egg station was clearly marked on the side (unlike some places that offer this and you never know! ), with options for fried, poached, scrambled eggs, omelets with your choice of mix-ins, and of course, the "Chef's Egg" that I had in the restaurant. 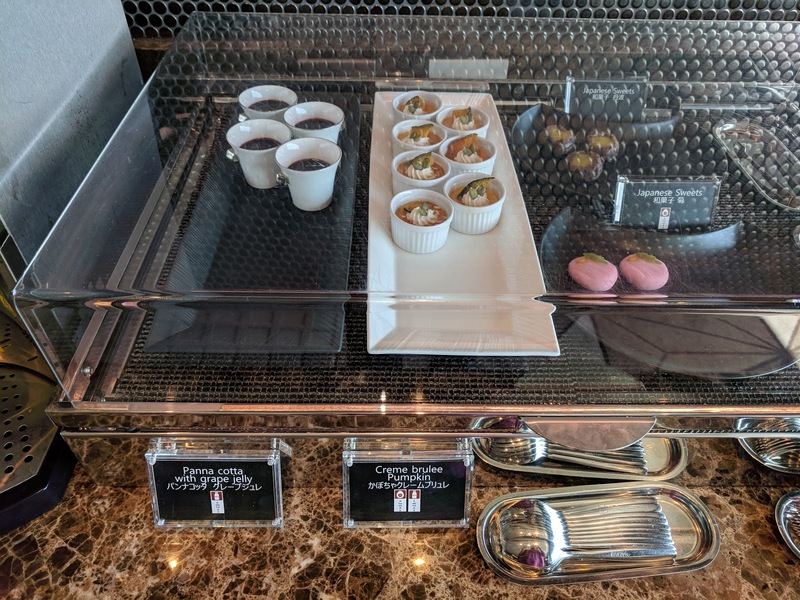 I saw that the lounge serves treats all afternoon (11am-5pm, basically, as soon as they tear down breakfast and before they set up for evening canapes), but assumed it would be like most hotels - some fruit, granola bars, and token leftover pastries from breakfast. I couldn't be more wrong. 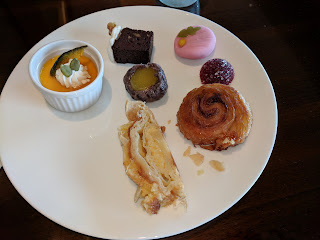 They had pastries, puddings, Japanese sweets, and more. I was blown away by both the selection, and the quality. Many steps up from breakfast. 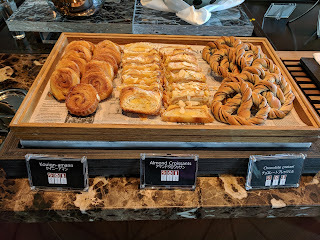 Pastries: Kouign-Amann, Almond Croissants, Chocolate Pretzel. The pastries were not leftovers from breakfast (besides the chocolate pretzel, which I didn't care for). And they were much higher quality than the breakfast items. Next up, a light choice, 3 flavors of pate de fruit. I really liked the fruity berry ones. Crazy sweet, soooo much sugar, but, I liked them. 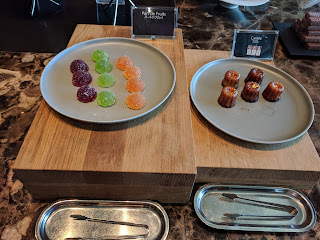 Mini canele were cute, with gold leaf, but not actually good. 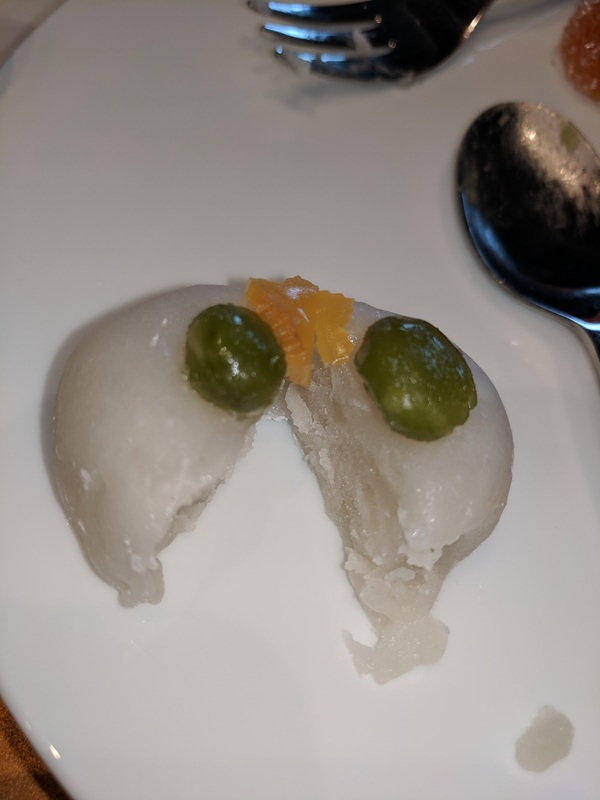 They were a bit spongy and mochi like, which was just ... odd. 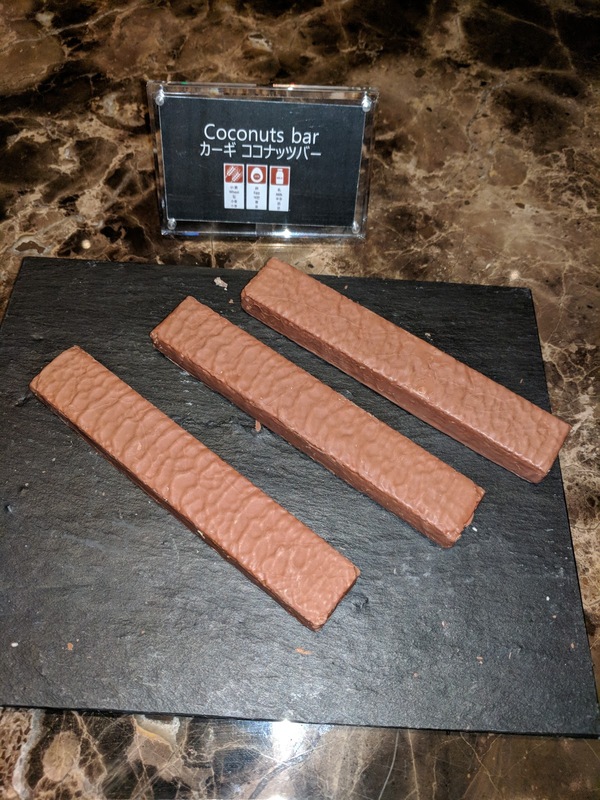 This looked identical to something I had in the evening that was labelled coconut bar. I didn't try this one, but perhaps it had chocolate cream filling rather than the coconut cream the coconut one had? Probably the same wafers and chocolate coating. I didn't try the boring looking cookies, labelled, simply, "cookies". Cookies: Salt Caramel Macaroons, Marshmallow Chocolate Brownies, Passionfruit & Lemon Macaroons. 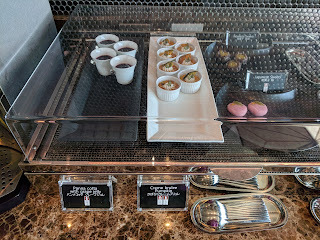 I didn't try the macaroons either, as I don't really care for macaroons, and, I was provided with macaroons every night at turn down service (and they were always fine, different flavors daily, but still, macaroons). 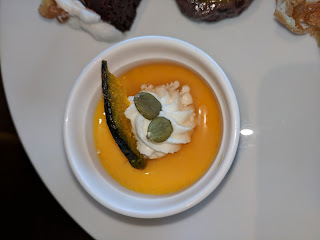 Puddings: Panna Cotta with Grape Jelly, Creme Brulee Pumpkin, Japanese Sweets. The pastries were fantastic, but, things got more exciting in the cold well. Because there was this. You know how much I love puddings, and panna cotta and creme brulee in particular. I tried all of these. Cakes: Rose Cake, Eclair Salt Lemon, Opera Cake. The next cold well held a beautiful layer cake with rose, cream, and strawberries, a deep dark chocolate opera cake, and eclairs (uh, "salt lemon" flavor). The eclair flavor changed daily, I also saw raspberry and vanilla. 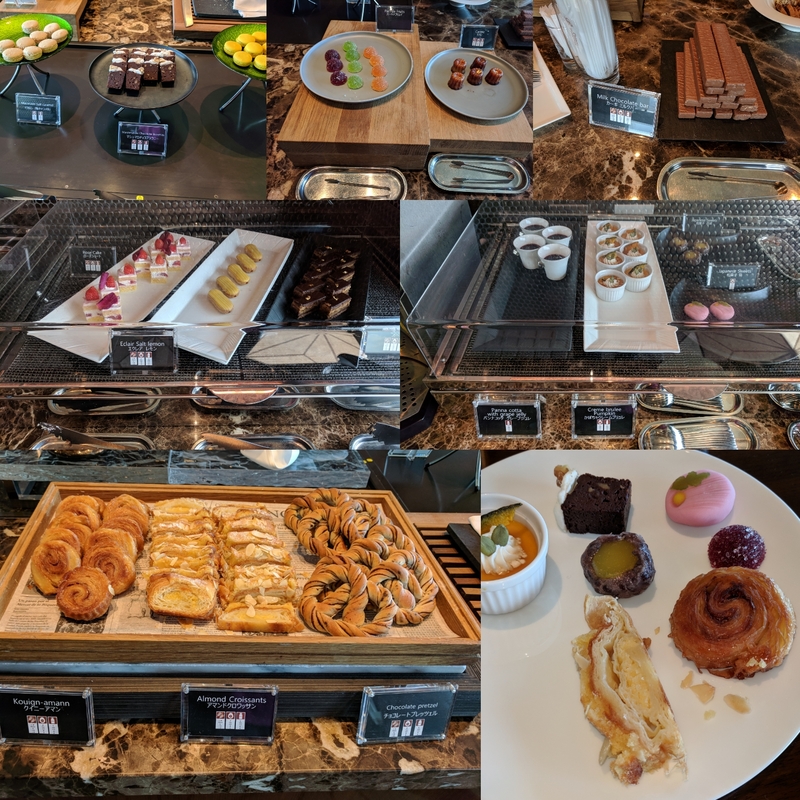 My first visit was at 11am, before I left the hotel for the afternoon. 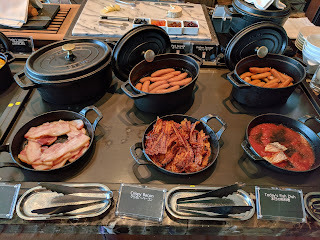 I had a huge breakfast at the buffet earlier than morning, but ... so many things looked good, I had to try a bunch. As you can see, I went for my top two pastry choices, a few little sweets, and my top pudding choice. The kouign-ammn was more like a kouign-amann slice, fully caramelized on both sides. It was fantastic. 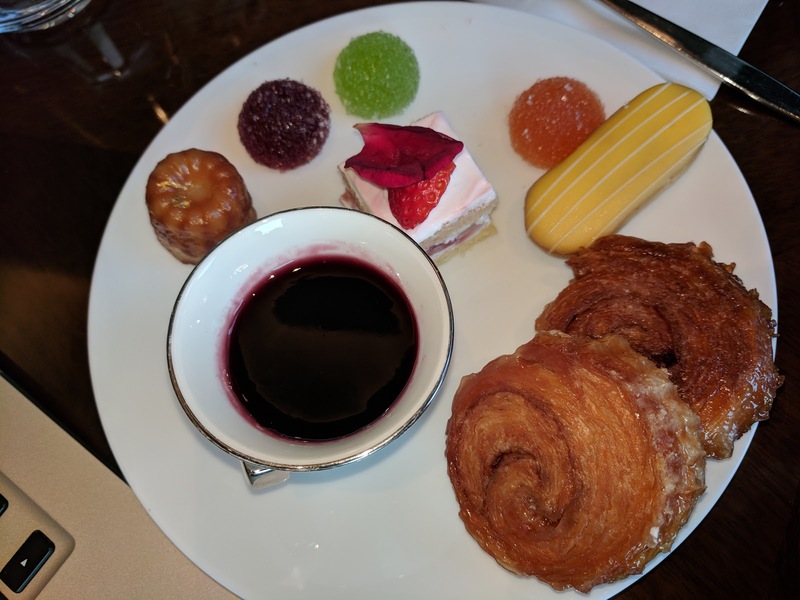 The breakfast pastries may not have been great, but, this was perfect. Buttery, flaky, perfectly caramelized, oh so sweet. 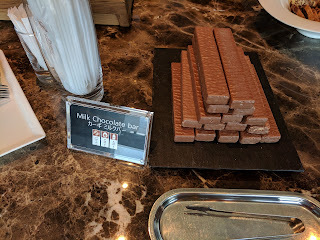 Why on earth did they not offer these at breakfast? 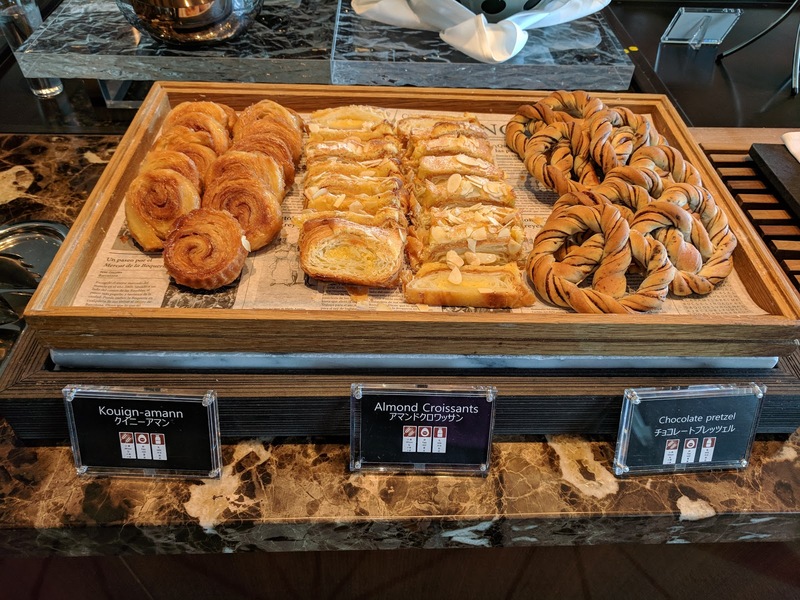 The almond croissant was also a slice, rather than full item, stuffed with almond paste, topped with sliced almonds and powdered sugar. It was ok, flakier better pastry than breakfast pastries, but, not nearly as good as the kouign-amann. Then again, few things ever are. The chocolate brownie was very dense, very fudgy, studded with nuts, quite good. Marshmallow on top was fluffy and gooey. For a brownie, pretty good. I obviously had to try the creme brulee. It was great, actually almost like a flan, as it had a sweet sauce on top rather than a brulee layer. If it was labelled pumpkin flan, I'd say it was amazing, as a brulee, well, not quite. But it was a thick custard pudding, well set, nice creamy consistency, good pumpkin flavor. Topped with a little whipped cream, pumpkin seeds, and a piece of dried pumpkin (which they had as chips in the evening snack buffet too). I really enjoyed it, and found the size perfect: enough to really get more than a few bites, but small enough that I could try the other things too. My favorite item. I returned several other times, and always enjoyed this. 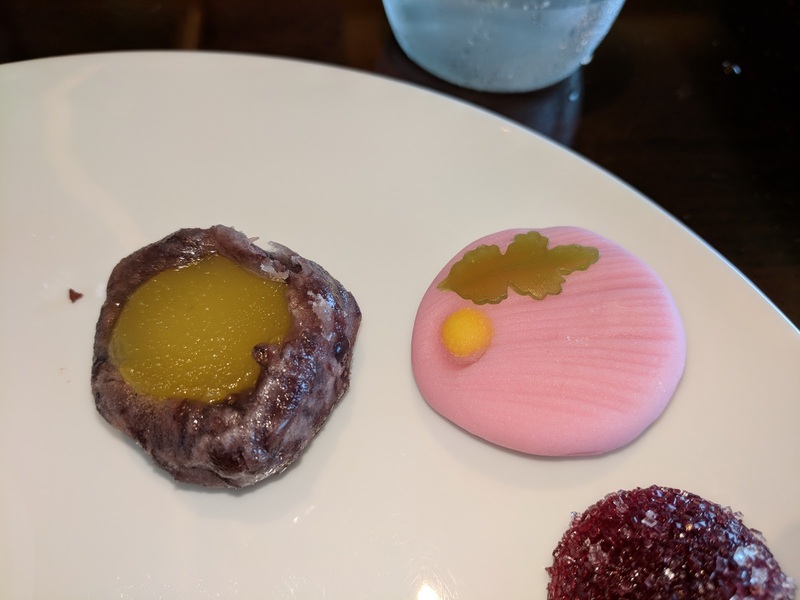 I don't know what these were exactly, as they were labelled simply, "Japanese Sweets". 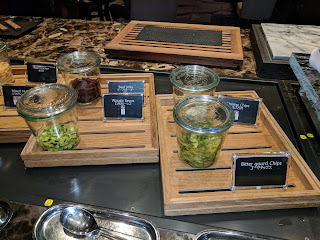 The one on the left seemed to be red bean, good size bits, soft, not too sweet, but I'm not sure what was in the center. 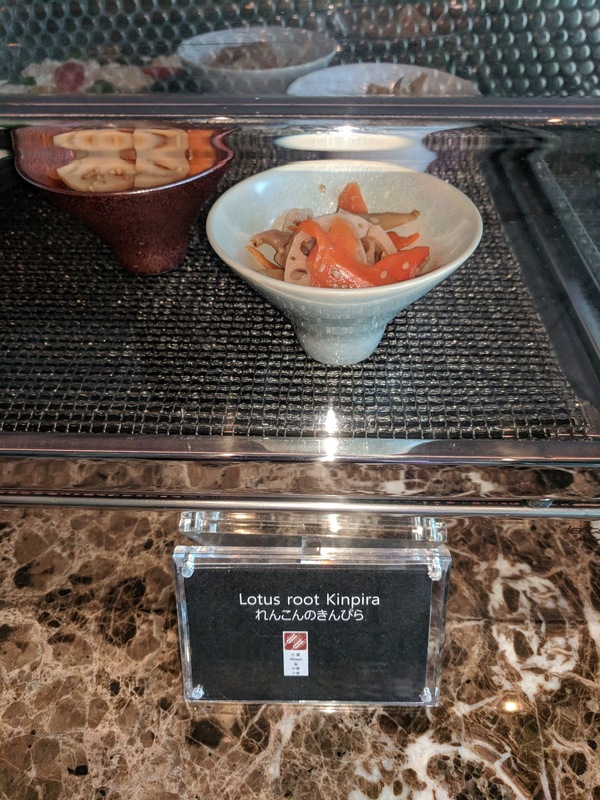 Lotus paste? I never figured it out. The middle one also seemed to include red bean, in the filling, in a soft mochi-like wrapper. 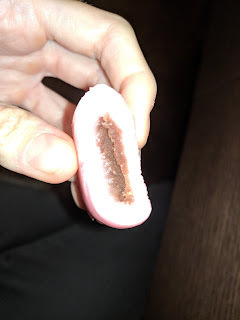 It was ok, not particularly good nor bad, just soft mochi, standard sweet red bean filling. 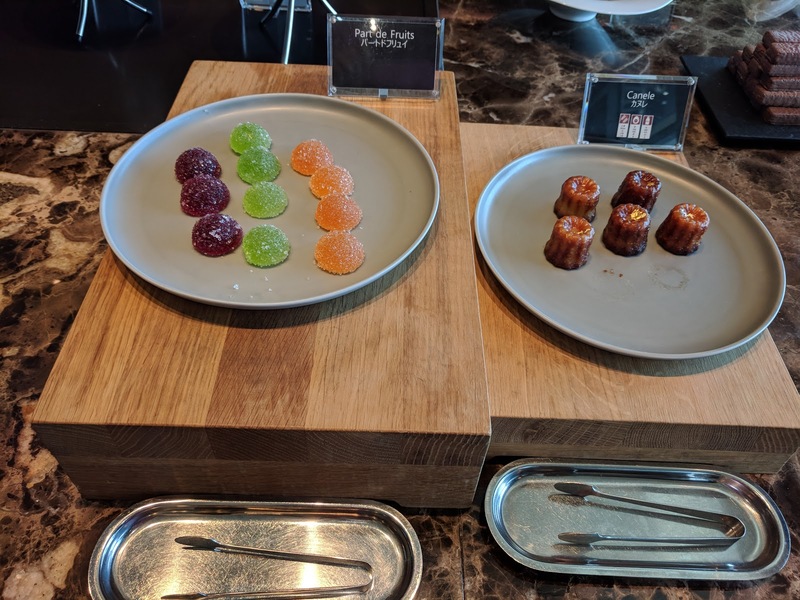 I returned to the hotel at 4:30pm, and stopped by the lounge on my way back to my room, hoping they'd still have the sweets out before canape time. So, uh, another round happened. The kouign amann were less amazing this time around, less caramelized, I guess, older. The rose cake wasn't remarkable. Just layers of white cake, cream, and unripe strawberries. And the mini eclair. 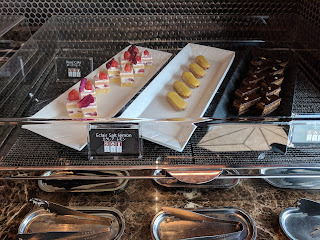 I didn't like it - the choux pastry wasn't very light, and it was filled with intense lemon cream (and I'm not into lemon desserts). Panna Cotta with Grape Jelly. This time I went for the panna cotta rather than creme brulee. 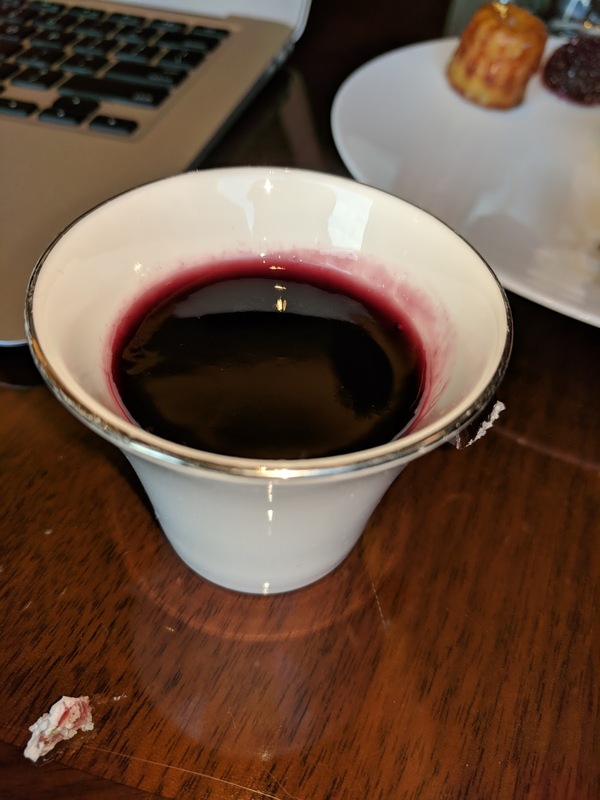 The top half was the grape jelly, more like a grape soup. Watery, not gelatinous. But very grapey, very sweet. I think I liked it. The panna cotta was below that, but very lost in the grape jelly. I barely tasted it. 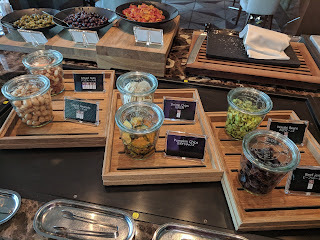 I also had a grape in the mix somewhere. Overall, interesting, but not nearly as good as the pumpkin brulee. I did make it back one more time. I went right for my favorites, the kouign-amann, the pumpkin pudding, the pate de fruit. 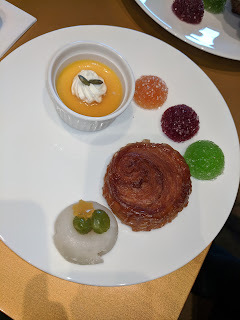 The pumpkin pudding was again quite tasty, the pate de fruit crazy sweet, and the koign-amann good but not amazing. The final item was another Japanese sweet. This had the same soft mochi wrapper as the red bean filled one, but it was filled with ... something. A bit chalky, sweet, no idea what it actually was. On top, candied soy beans. Interesting at least. 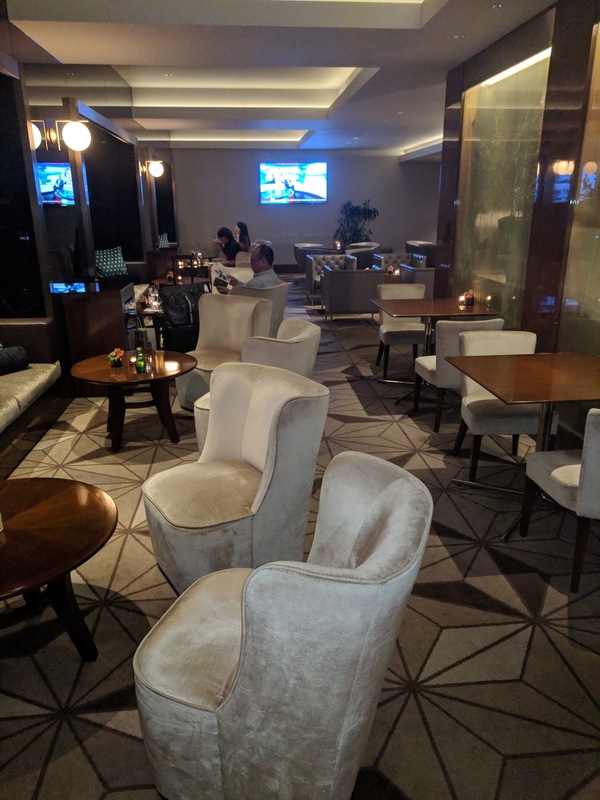 At 5pm, the lounge shifts into evening mode. Canapes are served from 5-7pm, but drinks and snacks are served until 10pm. 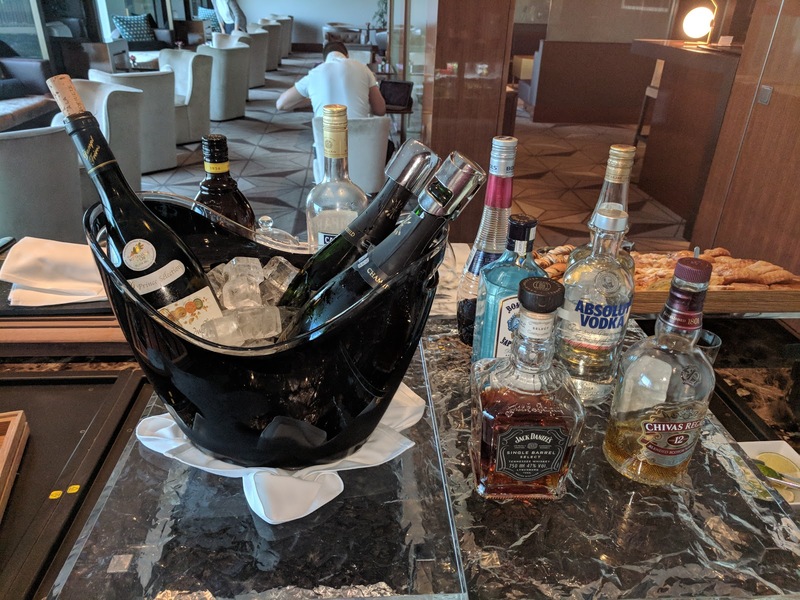 Some of the most generous hours I've ever seen from a hotel lounge. 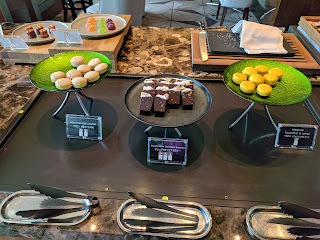 The canape selection is all chilled items, but I really enjoyed some of it. Not nearly as extensive as somewhere like the Sheraton on the Park in Sydney, but far more exciting than just some cheese slices, little sandwiches, or more common lineups. 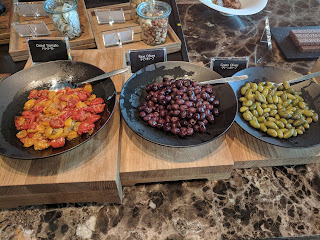 Dried Tomato / Ripe Olives / Green Olives. I didn't try the olives, but the "dried tomatoes" were actually juicy, flavorful, sundried tomatoes in an oil sauce. 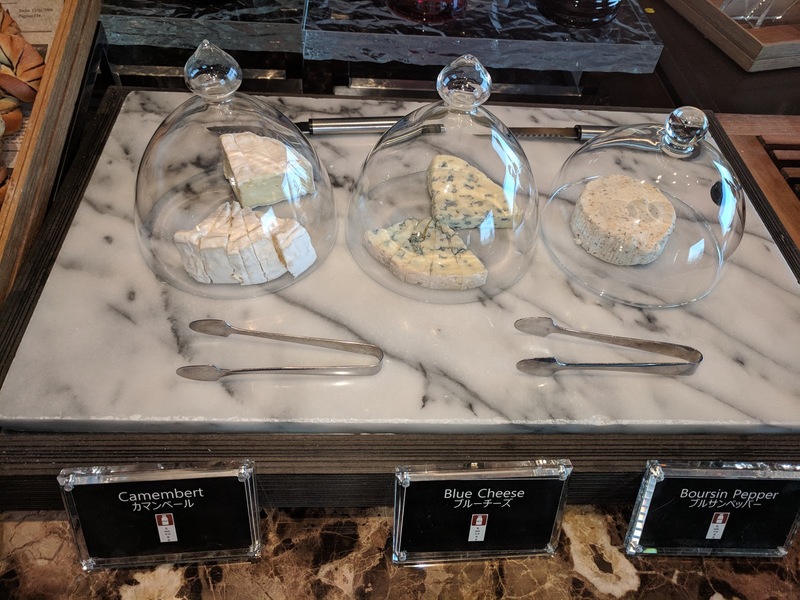 Cheese: Camembert, blue, boursin pepper. 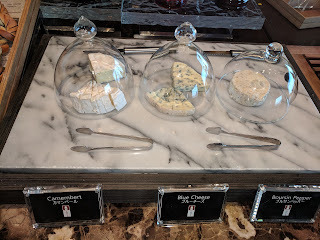 A few cheeses, much like breakfast. No crackers to go with. Pastries: Kougin-Amann, Almond Croissant, Chocolate Pretzels. The pastries from afternoon tea stayed out. 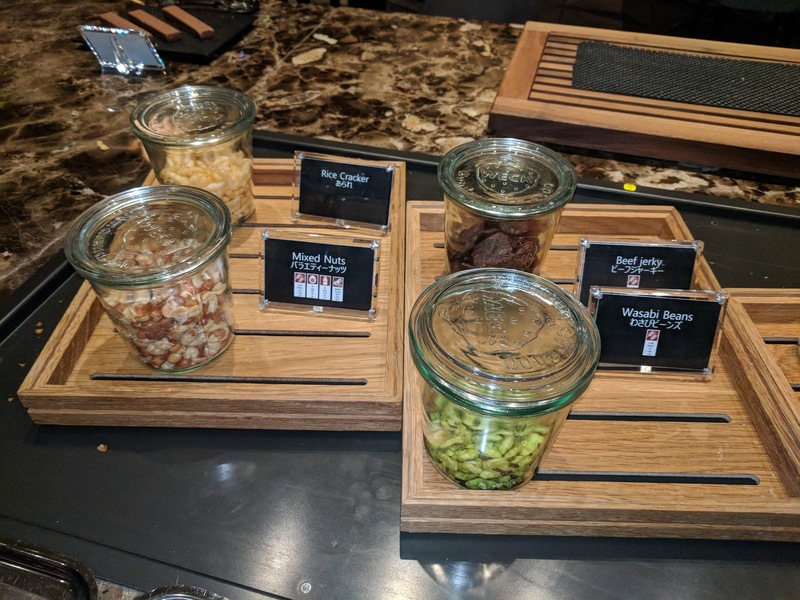 Snacks: Mixed Nuts, Squid Peanuts, Shrimp Chips, Pumpkin Chips, Wasabi Beans, Beef Jerky. The snacks are kept out alongside the drinks into the late night, so I skipped them on my canape visit, but had them most other nights as I returned back to the hotel. Braised lotus root and some veggies, I think burdock, carrots, peppers, all thinly sliced, and in a sweet sesame sauce. Crispy veggies, flavorful sauce, my second favorite dish. Rather than mozzarella cheese, it was a caprese made from tofu. The tofu wasn't a style I had seen more, soft and crumbly at the same time. Little cherry tomatoes and basil completed it. 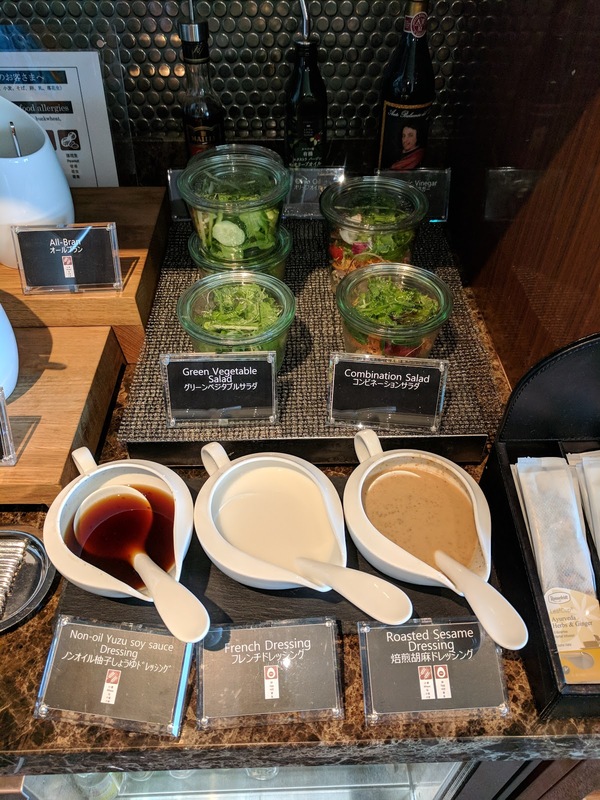 It needed a bit more ... something, like balsamic drizzle? 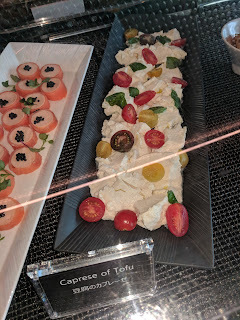 Kinda boring flavorwise, but a unique spin on caprese. I also really liked this. 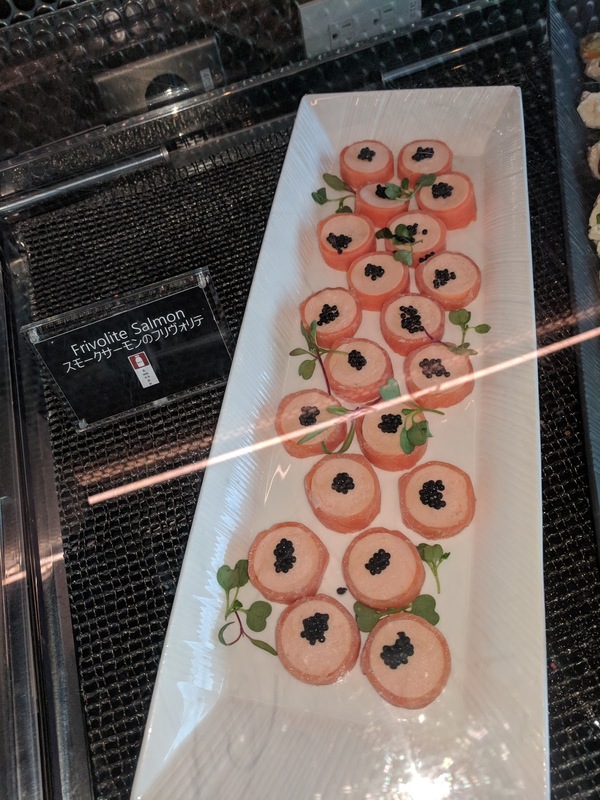 A thin slice of salmon, wrapped around a salmon mouse, with a little roe on top, garnished with micro basil. The smoked salmon flavors were great, it was creamy, and overall, just a wonderful tasty bite. I had a bunch of these. This was ... kinda ok. In the middle was cooked scallop, with two types of terrine on either side. 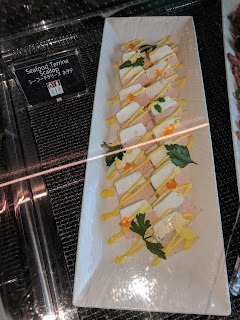 The white one was very rich and creamy, the pink one a bit fishy, and a bit like cat food smells. But I loved the creamy yellow sauce on top. Third favorite. I didn't try the slices of roast beef, served with cornichon slices and olives. Agrodolce of Duck & Autumn Eggplant balsamic flavor. I skipped the duck bits, but I grabbed some eggplant. It had a nice smoky quality to it, but overall, this was a very oily dish. I think with some bread, this, or the tofu caprese could make nice toppings. And of course, drinks. A decent selection, self serve. 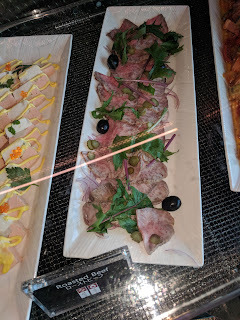 From 5-7pm, the lounge serves canapes, but on my first few nights, I never got back to hotel early enough to try them. Late Night Drinks & Snacks. But the lounge stays open until 10pm, with drinks and little snacks, and you know me and snacks! I needed to try them. 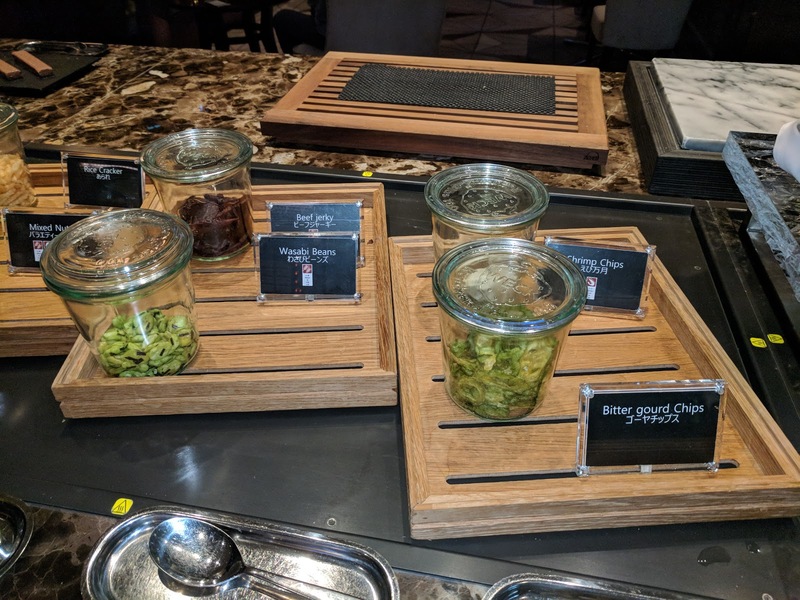 Shrimp Chips, Bitter Gourd Chips, Wasabi Beans, Beef Jerky. The shrimp chips were rice cracker disks, that didn't seem too bad at first, but had a horrible aftertaste. Did not like. The bitter gourd chips I was excited for, since I love veggie chips of all kinds, but these had a strange flavor. Moving on. The beef jerky was really, really chewy. As in, I couldn't get through it! Another fail. But the wasabi beans ... those I loved. Crunchy. Great wasabi flavor, good burst of flavor, but not too strong. Far better than wasabi peas. My favorite, night after night. 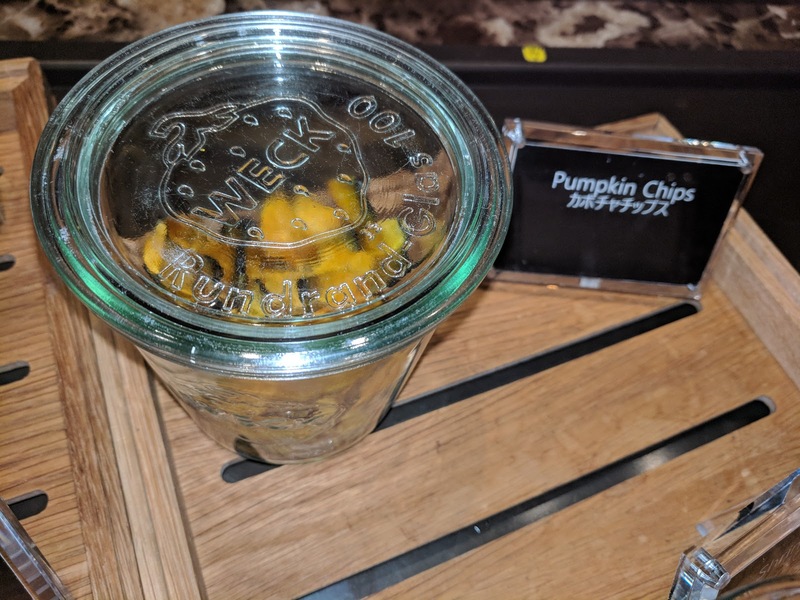 The next night, the bitter gourd chips were replaced with pumpkin chips. I was again delighted. I love veggie chips! But these were super crunchy, and again, I just didn't care for them. The rice crackers were pretty boring, just rice cracker sticks. 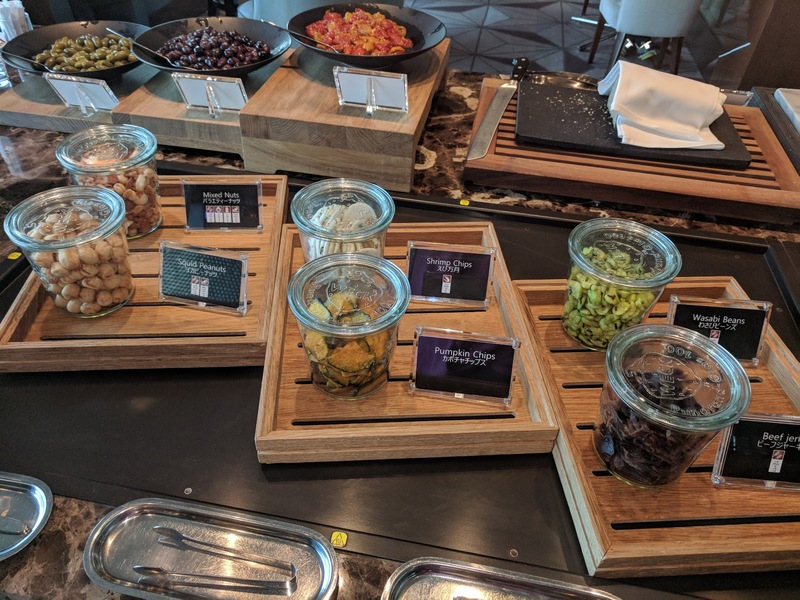 The mixed nuts were a great selection though. Mostly peanuts (salted roasted peanuts, skin-on spanish peanuts, sweet honey roasted peanuts), but also a few token large corn nuts and some kind of crunchy coated dried fruit, I think raisins. 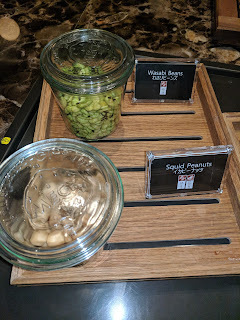 The later were a tease, as they looked like coated peanuts, and given the other items I expected peanuts, but alas, chewy fruit! The next night some squid peanuts joined the mix. They were great, crunchy shells, peanut inside. I didn't really taste squid, but I was happy to snack on them. 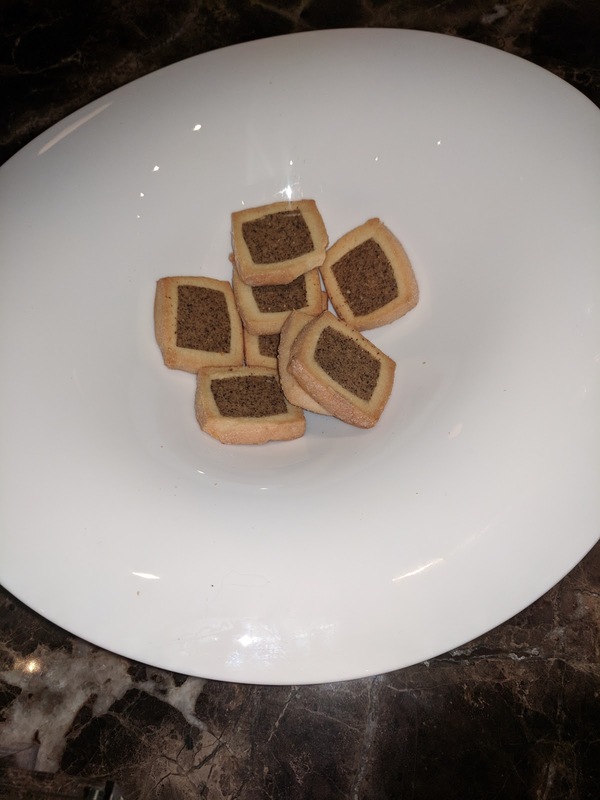 The first night had sesame cookies, the second, plain cookies. 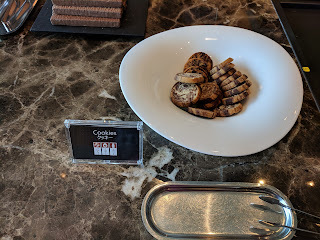 I didn't try either, as I don't really like cookies, and these certainly didn't look good. This was pretty good, layers of wafer cookie and coconut cream, enrobed in milk chocolate. Very large size pieces though, I wished they were a bit smaller.